Web hosting is an absolute mess. Still. Even with a swath of new, so-called “good” shared hosts, an endless number of “rock solid” VPS providers, many brand new niche Platform as a Service (PaaS) providers, and several managed and dedicated options, the world of web hosting is still a disaster. Of course it isn’t the same disaster as it used to be—price—no, it’s a brand new disaster now—choice. There’s just so much choice on the market these days, with everyone innovating around the same core prodcts: offer more RAM in your base VPS, wrap a better interface around EC2, offer unlimited subdomains on shared hosting at 13cents per month. It’s all the same products over and over again. If I had any clue how to even go about setting up a hosting company, I’d start by targeting people like me: freelancers who host low-traffic sites for a dozen or so clients at any particular time. At the moment, I’m moving (again) from a shared host to a VPS. I host about 10 personal sites (development sites, a recipe organizing site, a site for collecting photos, a site for storing my bookmarks, etc), and somewhere around 10 client sites. Not a single one of these gets anything close to high traffic. Some of my personal ones get a few hundred hits a month, while some of the bigger ones get less than 10,000. We’re talking very minor traffic. But they’re all important. My bookmark manager is just as important to me as my clients’ sites are. The problem is that the market doesn’t think they’re important. The market thinks that I’m happy enough to house my low-traffic sites on a shared host until my numbers start to grow. But of course that just isn’t the case. — I loathe cPanel. It’s massive and almost completely unnecessary. I want a simple interface for adding new sites and subdomains. Simple as that. — Git: I thought this would be standard nowadays. It isn’t. — Affordable pricing—I know that there’s great, dedicated and niche-specific hosts out there. But, as good as I’m sure they are, I’m really not going to spend $99 per month to host my clients’ sites. That’s simply too much money to serve up less than 30,000 pageviews, no matter how fast the support response is, or how much uptime you guarantee. Why doesn’t this exist yet? That’s the part I’m not sure about. It seems like there’s a huge market of people like me out there, who would happily turn over $30 a month to get a nice, simple interface for managing our low-traffic client sites. But there isn’t. I really, really hope a talented entrepreneur stumbles past this post and gets inspired to start a new kind of hosting company. Note: I feel very-well qualified to write about this topic. 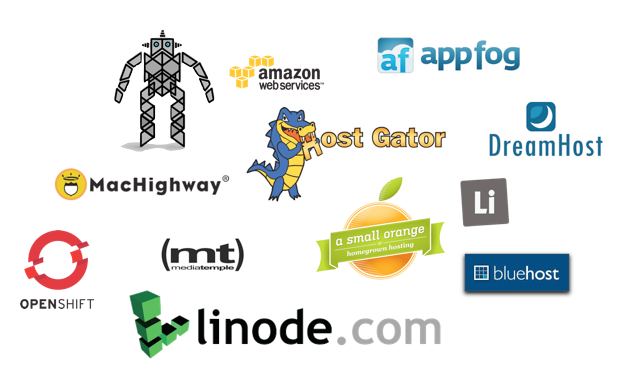 To date, I have tried GoDaddy (*shudder*, I know), Host Gator, Bluehost, Dreamhost, Linode, Mac Highway, Media Temple, EC2, Pagodabox, Open Shift, Appfog, A Small Orange, and Lithium. My best results have been with Mac Highway and Linode where my stuff is currently housed. Despite trying 13 (thirteen) hosts, I’m still unsatisfied.